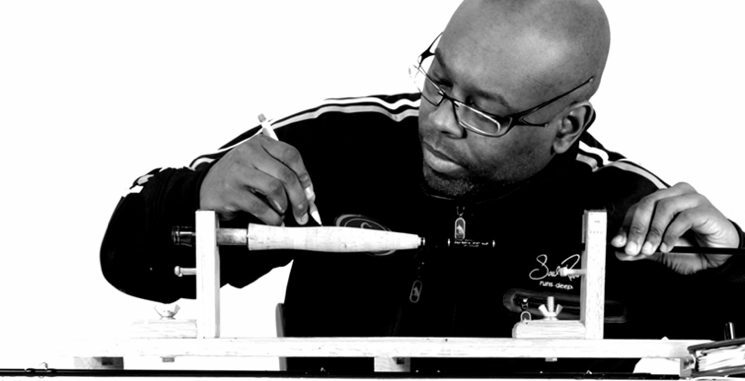 Chad Brown is a gifted artist, designer and businessman. He recently founded Soul River Runs Deep, LLC, a fly fishing apparel and goods company offering fly fishers fashion minded gear backed with a humanitarian cause. “Soul River is about coming together as one. Celebrating our differences, seeking our solitude and bonding by the journey we take to the river from our busy lives. We all share one thing in common, the river. It passes no judgement and no tolerance of any ignorance. Soul river is heavily vested on the rivers, the surrounding communities, and all who embrace the river and the healing properties of fly fishing”, says Chad Brown. I have to admit, when I first ran across Soul River Runs Deep, I failed to see the full meaning behind the name and scope of the company. Fly fishing touches all of our souls and I think there’s nothing cooler than a company using the sport of fly fishing to help others in need. It was only after I talked to friends who had volunteered their time with the humanitarian work sponsored by Soul River Runs Deep, LLC, that I was able to fully grasp and appreciate the story, purpose and volunteer work managed by the company. When you purchase Soul River products, you’re not don’t just walking away with a cool piece of clothing or gear, you’re helping to support all the humanitarian causes that the company, it’s partnerships and volunteers are working so hard to grow and keep alive. In June 2011, the River Ambassador Program was created by Soul River Runs Deep, LLC. It’s a partnership with Northwest Steelheaders Association that holds a multi-day fishing instructional course, offered free of charge to veterans who have recently returned from a war zone. The curriculum is specifically designed to support the participants coping with the stresses involved in reentering the civilian life, and start the healing process. Each participant receives skills and knowledge in river and nautical reading, entomology, and fly fishing techniques for trout, steelhead and salmon. The final day of the program several guides volunteer their time to take each of the attendees out on a guided float fishing trip. The purpose of the program is to show how angling can help participants develop coping skills that helps alleviate stress, find inner peace and achieve a sense of serenity. This is just one of the ways Soul River Runs Deep, LLC gives back from the proceeds of the company’s sales. Check out the video below that showcases the River Ambassador Program in action. Thank you to each and every one of you who took the time to read today’s post about Soul River Runs Deep, LLC. Please visit their Website to learn more about the company, like and follow their social platforms and give back by donating your funds or time if you have the ability to. The uniqueness of Chad Brown and his company don’t come around very often, and when they do, it’s important for us to show our support to ensure companies such as this one can succeed and make a difference with its humanitarian work. I’d like nothing more than to see Soul River prosper and be able to form further partnerships and expand its programs to other regions. 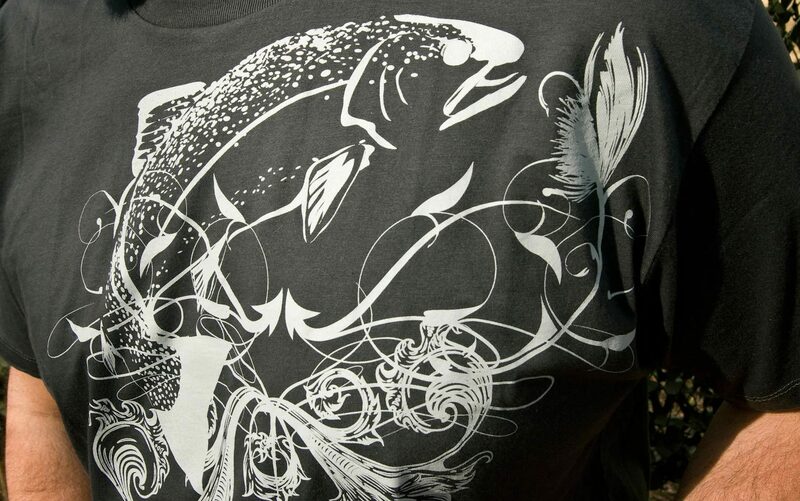 This entry was posted in Fly Fishing Gear and tagged chad brown, Fly Fishing, Gink & Gasoline, Gink and Gasoline, Kent Klewein, Louis Cahill, river ambassador program, soul river, soul river clothing, Soul River Runs Deep by Kent Klewein. Bookmark the permalink. When my separation/divorce was fresh, I went fly fishing 5+ days per week (I still do), even just for 40 minutes at a time. It was the only thing that relaxed me, centered me, as it were. Therapy helped, but when I felt like my world was falling apart around me, I was able to be humbled and gratified by fishing just for a few minutes to a few hours. I always left the river feeling like no matter what was going on in my life, there was still simple joy to be found. Great story for this time of year. I have found peace, solace and inner strength on moving water as long as I can remember. I may have to profile this company in an upcoming article that I write for my TU Chapter’s newsletter. Really cool Kent. Just looking at the website and their clothing and gear, the “cool factor” is definitely there. 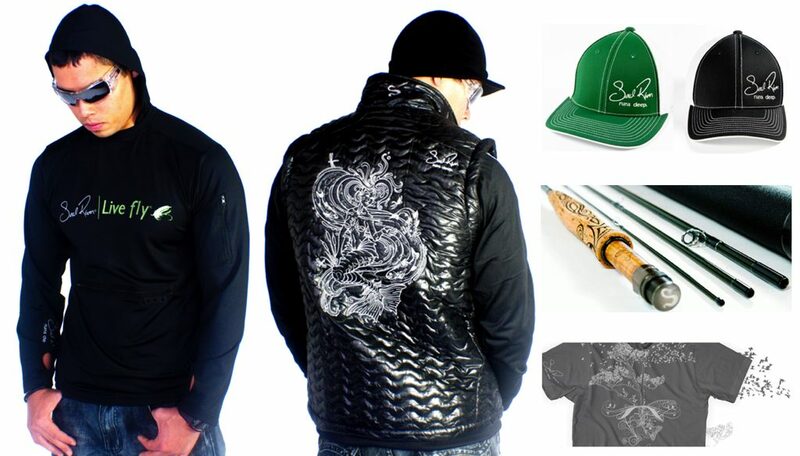 The artwork on the clothing and how he engraves art into the cork grips on his rods is amazing. And the story of the NAIAD i s really cool too. But then you see what goes on behind all of that and it’s that much cooler. I have several relatives and friends that have seen combat, and many of them have had problems coping with what they saw, and what they went through. I personally can’t imagine it. It takes a special person to want to be on the front lines, defending our freedoms. It’s people like Chad, and his staff, that really make a difference in the lives of these men and women. Taking your own time to give back and give them an outlet from their daily stressors is something everyone should do, even if it’s just once. If you can’t take them fishing, show them how to tie a fly if you’re able. Just Google “fly tying ptsd”…. it’s been used for years, successfully, to help with those that have been wounded in war, and for those suffering with PTSD. Short version: Very inspiring, major props to Chad and Soul River Runs Deep. Thanks to Kent for posting this. Is it dusty in here, or is that just me? Thanks for posting this Kent. Looks like a great organization, and it is even local (to me). As a vet, this is something I can really get behind. I am nowhere near cool enough to pull off those clothes, but I will buy a t-shirt nonetheless. Chad is one of the most honest down to earth guys you will meet. His life and passion to help those who struggle with their demons in the inner city and those with PTSD is courageous and honorable. I am proud to support him and his passion to help others. Thank you for telling his story. There is something about the solitude of the woods, the mesmerizing sound of water tumbling through the rapids; the hypnotizing effect of the branch of a newly fallen tree gently swaying back and forth in a stream and watching the resident animals carrying on with their lives, oblivious to the stresses just on the other side of the tree line. I have lost the friendship of a number of friends who have succumbed to PTSD; it is a devastating disorder that changes forever the personality and quality of life of its victims; substituting alcoholism, depression and torment for the vibrant inquisitive soul that use to thrive there instead. I am glad to hear your friend has been able to adapt and become a productive member of society again, unfortunately many, many do not and prematurely age in body and mind to a remnant of who they were as we remember them. I will definitely support your friend’s effort; the one aspect that separates humans as a species is our ability to have an impact on each other.